So everybody’s heard that Atlanta calls itself the “capitol” of the New South. Ok, I’ll give them that. But if Atlanta is the “capitol”, then Charlotte is the heart of the New South. Charlotte is the 20th largest city in the US with the 7th busiest airport, a small big city, but with big city amenities, without most of the big city problems! And the economy is pumping here! What is the New South? The short answer? A modern city, a southern city that has moved past its racial divide, industrialized and progressed on broad fronts! We have a museum here that explains it better, the Levine Museum of the New South. This page was first posted in 2008, and most recently updated to 2014, and this definition seems to change as well. Charlotte is a modern city that has kept many of the south’s best traditions, yet still feels culturally northern on most days. Considering a move to Charlotte? You are in good company. People, lots of people, have moved to Charlotte NC in the last 14 years. Since 2000, more than 300,000 (a town about the size of Cincinnati) have come from all over the country, all over the world, for a wide variety of reasons. I’ve been working with relocating families and young folks for more than 10 years, and I’ve found more than half move here purely by choice. People with “portable” jobs, or retiring folks, come here for a host of reasons centered on our lower costs of housing, cost of living generally and comfortable climate. Call me direct for more relocation information at seven zero four 390-6221. The other half relocate to Charlotte by corporate transfer or for their first job. Charlotte is very friendly to young people! Everyone knows the banks are big business, but so is energy and transportation plus other financial companies. MetLife brought their retail operations to South Charlotte last year (2013), United Technologies Aerospace their headquarters (2012) the year before. In the last few weeks, Fortune 500 Sealed Air announced they were moving their corporate headquarters here, and over 1300 jobs that go with it (about 50% transfer, 50% new hires) And Charlotte has become a hub for the IT world as all these banks need secure online transactions. For the fastest introduction to Charlotte, try my fact filled You Tube video, Introduction to Charlotte -now with over 75,000 views! No fluff I promise, it goes quick, watch 4 minute video here Charlotte, NC. Why Do People Move To Charlotte? First is Charlotte’s strong local economy, for more than a decade, Charlotte has produced jobs at a rate far faster than national averages. Second is that housing is and remains very affordable, in fact, it has been argued that Charlotte is the “only major city in the US that is objectively affordable.” Third, Charlotte is a large modern city in the south that blends southern hospitality, rarely do you hear a horn honked in anger on the roads, with modern sensibilities, Charlotte has been called one of the ten best cities to live and work in for young African-American professionals. The city trends young and is diverse. Charlotte has shredded the images of the old south, and is creating something new with the metro areas along the I-85 corridor, stretching from Atlanta to the south through Charlotte and on to the great Universities at the Research Triangle. Currently there is more than 1 Trillion in GDP produced in “Charlanta”, the corridor along I-85 from Atlanta to Raleigh. Check out more from Richard Florida inthe Atlantic. People like our neighborhoods and communities, love the amount of home they can get for their money, and good schools are available for their children. 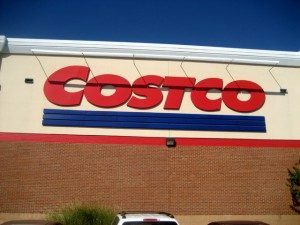 All their favorite brands are here, Target, Costco, Whole Foods, Ruth Chris, Coach, you name it, they are here. Then once the family arrives, we do move quite a few grandparents hoping to be closer to their grand-children. Retired folks appreciate living in a modern city with access to great health care but also a great cost of living- the lowest cost of living in the south. So the short answer to why so many move here by choice? They are looking for a better standard of living- more home and more disposable income, which in most cases means less taxes. (We routinely talk to “tax refugees” from northern NJ, NYC and Long Island.) Many are looking for a slightly slower paced lifestyle: one client’s New York family thought he’d grown younger here- he told me no, they (the New Yorkers) just looked that much less stressed out. The side benefit? Generally much more pleasant weather, with shorter easier winters and a long spring and fall. New Yorker’s and folks from the Northeast always appreciate our low taxes, but I was surprised recently when a Texan from Austin said the same thing- taxes in South Carolina were less than a third of what he’d paid… and anyone from Florida or the coast will appreciate our low property taxes AND low insurance rates. We have a very low frequency of natural disasters ( we are 3 hours from the coast) – consequently we have very low property insurance rates. Why Do Businesses Relocate To Charlotte? They mention 3 reasons, 1st is our highly educated workforce, 2nd is the high quality airport, and third is the affordable cost of living. 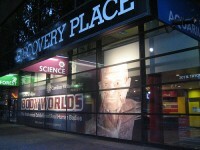 Find out how much you can save at Money Magazines Cost of Living Comparison. One physician moved from Chatham NJ, and took almost a 20% pay cut to move here, yet they substantially increased their disposable income and are enjoying the increased standard of living. Did I mention the mild weather? Charlotte has all four seasons. My first three winters here I didn’t wear a winter coat. It’s true, I’ve since adapted, but still own the nice dress coat I bought in New York so many years ago. Snow is so rare that our snow removal policy is “let it melt.” Seriously, the Interstates are plowed, but little else! Once every 3 years the plows have to work a bit harder, but typically a day in the upper 50’s is just around the corner. We had stunningly beautiful leaves this past fall, with fall and spring long and mild. Summer is hot and humid, but not much different than Washington DC in the summer if that helps. Physicians come here, after residency, or mid-career to improve their lifestyle. One internist told me he had increased his standard of living 40% or more with his move south- better wages, better hours, and MUCH lower living costs than Massachusets. Another, 4 years out of residency came last year because his Long Island practice offered nothing but Saturday work for as long as the eye could see, and a standard of living that by the high costs in New York, was not much above average. Charlotte real estate suffered in the great recession, but not anywhere nearly as bad as Florida and the sand states out West. We never had the (bubble) big price run ups, and we’ve never suffered the broad declines in value the rest of the country has suffered. Real estate roared back in 2013 and so far, 2014 has continued the year over year price increases, now 27 months in a row. The recovery has moved from the inside of the city out, and from the bottom up in terms of price. What Does This Mean To A Family Moving To Charlotte? It means there are many safe choices in real estate, most of our communities have rebounded and are growing again. But like anywhere else, a buyer needs to “choose wisely.” We are strong believers in the power of community- not just in the life of the city, but in the stability of our real estate. So we advise buyers to find their favorite neighborhoods first, and then focus in on the house. 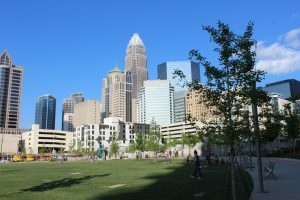 That is one of the main purposes of CharlotteCommunitiesOnline.com, to be a place where people can find out more about the diverse city known as the Queen City, Charlotte NC. Where are you from? That is a question you will hear often in Charlotte. The sign (above left) sits on the Green, an inner city park on South Tryon across from the new museums, the Bechtler Museum of Modern Art and the Mint Museum of Craft and Design. My family has lived in Charlotte for 20 years, raised a family here and enjoy living here. Still we visit friends and family along the East coast- Charlotte is centrally located, a one day drive,or one hour flight, to Washington DC, or Orlando. But because just about everyone comes from somewhere else, it is easy to get to know people in Charlotte. I asked one mother of three after one year, what the biggest surprise was? She told me, “How easy everything was… the kids quickly made new friends, her husband liked his work again, and she had made good new friends as well.” Then she swore me to secrecy, since her husband had wanted to move out of NJ for almost 10 years! The stately home on the left is in Myers Park, ($2M or so?) a beautiful neighborhood started in the 1920’s and 1930’s. 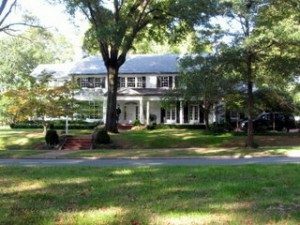 Designed by world famous landscape architect Frederick Olmsted, Myers Park features one hundred year oaks lining the streets and boulevards off of Providence Road. Next door is Dilworth, just the opposite in style featuring craftsman, bungalow and Charleston style houses. Both funky and campy Dilworth, is a walking neighborhood with Charlotte’s best city parks. for a look at the area K-12 public and private schools. For Colleges there are 6 (forgive me if I left you out) in the near immediate area. The largest, UNCC, University of NC at Charlotte, our excellent local UNC known for their business school, design, and architecture. A “New Ivy League” is Davidson College, also Queens University in Myers Park, Johnson C Smith College and Belmont Abbey College, a Catholic college in Belmont. Charlotte’s most recent addition is the well regarded Johnson and Wales University. Art galleries abound in NODA and South end, each with their monthly gallery crawls. 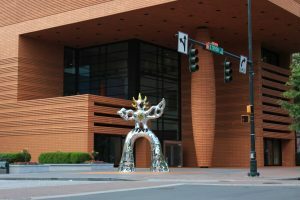 The Blumenthal Center for the Performing Arts brings Broadway to Charlotte and hosts a variety of wonderful events through out the year. Our enormously successful Arts and Sciences Council raises money for the arts locally, “to support cultural organizations, educational programs and individual artists throughout the region.” The Council ranks behind only New York City for independent cultural fund raising, ahead of Los Angeles, Dallas and all the other cities in the US. Museums include The Mint Museum, The Levine Museum of the New South, The Mint Museum of Crafts and Design, and the African-American History Museum. Festivals abound in Charlotte, the picture below was from the 14th Indian Festival, a block party on Tryon Street. The Greeks have a wonderful Greek Festival in Dilworth each September. Baklava! The town of Matthews hosts Matthews Alive annually on Labor Day weekend and draws some 30-50,000 visitors; the “Art in the Park” Art Festival held in Freedom Park in Dilworth each fall is a family favorite of ours. The Summer series of the Charlotte Symphony at Southpark cools the warm summer nights. There is quite a bit to choose from, I hope you’ll get involved and make a difference here. Uptown Venues Added Since the Start of the Recession ( Since 2008) Even when things slowed down, we didn’t stop! The Hornets are BACK in 2014! With an end, there is a new beginning and so it si The Charlotte Bobcats ended, and the reincarnated Hornets return to TWC arena after a playoff season in 2013. You can feel the buzz all the way to the Arboretum! You may have seen online complaints about Charlotte traffic. Most of these folks have never lived in a large city. This is NOT ATLANTA! Come and experience it for yourself, I think you’ll agree. There are some congested areas, but nothing like big city traffic on the coasts or nearby Atlanta for example. Yes we need some more roads, and more transit options- like almost every other large city in America. But average commutes are still in the 30-45 minute range. Some like to complain about our crime- and this is something we hired a new police chief to address. Like most cities, most of the crime is located in certain areas of the city. Many in my south Charlotte neighborhood don’t lock their doors in the day. The US National White Water Center is 20 minutes from uptown, near Mountain Island Lake, and is the home of the US Whitewater Olympic Team. Their rafting tours, hi-ropes confidence course and mountain biking trails are quite a thrill for the adventurous among us. It is one of a kind and a true Charlotte treasure. Charlotte has great recreation choices! Three lakes you can ski and fish in– Lake Norman in the north is the largest, is most crowded and where the BIG boats live, Lake Wylie to the south joins North Carolina and South Carolina, and nearer to Charlotte, the smallish but extremely convenient Mountain Island Lake with great views and affordable waterfront (<1M+/-), about 12 minutes to Uptown Charlotte, and 20 minutes to the airport. Light rail, the Lynx, connects Uptown with Dilworth, South End and on to Pineville- it is very crowded on weekdays and has ridership that is meeting 2018 ridership goals! Two more lines, one to Lake Norman, and one to the University of North Carolina-Charlotte, are in advanced planning stages. We are 2 1/2 hours to the mountains around Asheville, the Biltmore and the many artists who reside there. We are 3 hours to the closest beaches at Charleston with its great history, seafood, and Spoletto Art Festival. Charlotte Chamber of Commerce – Great regional economic data, business relocation help and more. Terrys Top Ten Communities- not quite ten yet, working on it!